3. Kidney and Liver Wind, Deficiency, which is caused by overwork and insufficient rest which unbalances the body’s natural rhythm. A probable advantage I had in my recovery is the undying knowledge that I would get better from this disease. My wife, Sally, knew it, too. We had years of successfully using TCM and other holistic healing for ourselves and our children, so we knew in our hearts of hearts and soul of souls that the body can heal itself. 4. Fully interlock your fingers and turn your hands facing away so you are looking at the backs of your hands and interlocked fingers. Sitting zazen. Sitting zazen generally is performed while sitting on cushions on the floor in lotus position, half-lotus position, or cross-legged. When I had Parkinson’s, I sat in a chair and started at 10 minutes. Post Parkinson’s, I gradually worked my way up to 30 minutes do it sitting cross-legged on a cushion on the floor. Please note: This was a small part of the Recipe (total of 2.5 hours, 30 minutes/day for 5 days), particularly when compared to everything else (performed daily for nine months). I had read about success with this method for getting the stomach meridian flowing in the correct direction, so it is the method I used, which is why it is listed in the Recipe for Recovery instead of doing stomach meridian acupressure and/or acupuncture. How do we heal our soul? Faith. 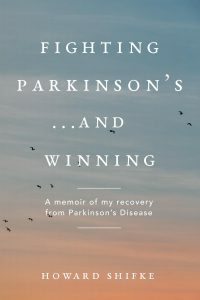 Faith is knowing I would recover from Parkinson’s. And with this faith of knowing I would recover from Parkinson’s, I took action to heal my body and heal my mind. Faith in my recovery is where I started, and it is something I needed to keep close to me during the hardest days on my journey toward recovery. Parkinson’s shook my foundation, and it is faith that got me through. Every day that I did my exercises and energy work and chanting and acupressure, it was with the faith that I would get better some time in the future. This faith was very important because it kept me on the path to healing my physical body and organs from deep within even though I rarely noticed much physical progress. Adrenaline Mode. I am walking through the jungle and a lion jumps out and starts chasing me. When my survival mode Adrenaline kicks in and I start running, other things are required of my body. The stomach gets the message from the brain that says, “eating is of minor importance right now so do not send me hunger pangs.” The bladder and the large intestine get the message from the brain that says, “no time to evacuate, so I need you to shut down temporarily.” The body gets the message from the brain that says, “you are being pushed to your physical limits, but I do not want to hear about your pain — shut it off.” The heart gets the message from the brain that says, “no time for joyful emotions, so do not release Dopamine, just store it for later.” When the lion stops chasing you, the mind keeps running from the fear.